A simple mod that switches lights that cast shadows to lights that do not cast shadows in order to increase performance. This mod is incredibly simple, it switches lights that cast shadows to lights that do not cast shadows. There are 5 different types of light sources for placed lights in Fallout 4: NonShadow Spotlight, Shadow Spotlight, Omnidirectional, Shadow Omnidirectional, and Shadow Hemisphere. This mod gets rid of almost all dynamic shadows cast by placed lights (NOT THE SUN) by changing all the Shadow Spotlight and Shadow Omnidirectional light sources to NonShadow Spotlight and Omnidirctional light sources, giving a nice performance boost. 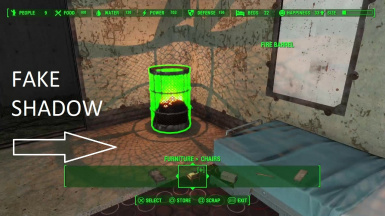 This mod does not touch dynamic shadows cast by the sun, just placed light sources like candles or lights generated by light bulbs, so this will be especially effective in interior cells. Any shadows you see from light sources are either from Shadow Hemisphere light types (there are very few of those in the game) or are gobos, which are fake shadows. This mod does not touch any cells, just the light sources themselves, so it should be compatible with almost everything. Obviously not compatible with any other mod that changes the same light sources like some lighting overhauls. 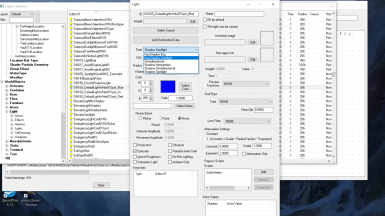 You can check for conflicts with FO4EDIT.